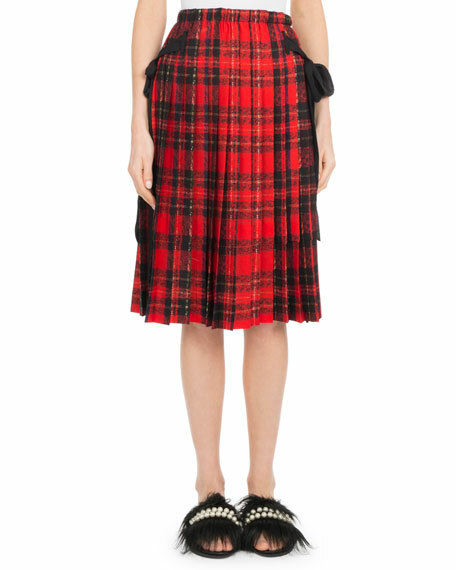 Simone Rocha pleated plaid skirt. A.L.C. "Grainger" skirt in floral print pliss??. High rise. Pleated silhouette. Midi length. Pull on style. Polyester. Imported. Model's measurements: Height 5'11"/180cm, bust 31"/79cm, waist 23"/58cm, hips 34.5"/87cm, dress size US 0/2. EXCLUSIVELY AT NEIMAN MARCUS Monique Lhuillier skirt in eyelet embroidered taffeta. Mid rise. Full, A-line silhouette. Knee length. Back zip. EXCLUSIVELY AT NEIMAN MARCUS Monique Lhuillier skirt in eyelet embroidered taffeta. Mid rise. Full, A-line silhouette. Knee length. Back zip. Polyester. Made in USA of imported material. 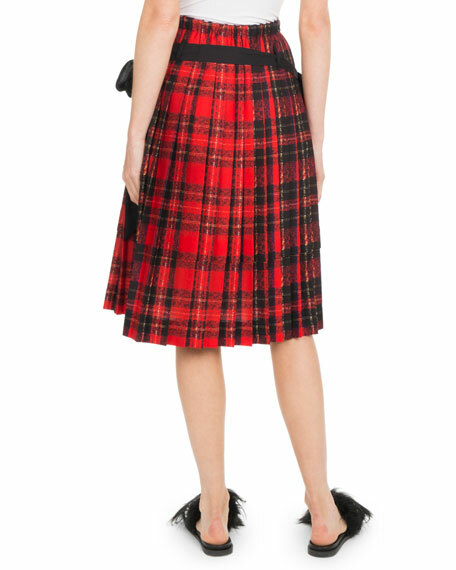 Nanette Lepore "First Bet" skirt in plaid. A-line silhouette. Exposed back zip. Asymmetric hem. Knee-length hemline. Polyester/rayon/polyurethane. Polyester lining. Dry clean. Made in USA of imported material. Model's measurements: Height 5'10"/177cm, bust 33"/84cm, waist 25.6"/65.2cm, hips 35.8"/91cm, dress size US 2-4/FR 34-36. Nanette Lepore "First Bet" skirt. Embroidered floral overlay. A-line silhouette. Hidden back zip. Knee length. Asymmetric hem. Polyester self/lining. Dry clean. Made in USA of imported material. Model's measurements: Height 5'10"/177cm, bust 33"/84cm, waist 25.6"/65.2cm, hips 35.8"/91cm, dress size US 2-4/FR 34-36.